Click on the program above to download the PDF. Gain a deeper understanding of the needs of donors and beneficiaries in today’s competitive philanthropic climate – and the innovative practical skills to satisfy them. Strengthen, expand and tap into the wealth of expertise and energy within CAGP’s professional network of colleagues from across the country. 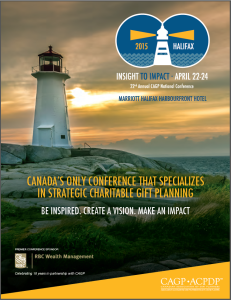 Embrace the opportunity to listen and learn from leaders who will challenge, compel and convince you to adopt a more strategic charitable gift planning approach.